A very sincere thank you to those young people who have contributed “Letters for Seminarians”. Your prayer and moral support will go a long way in the journey of our next generation of priests. Please keep praying that more and more young people are led by God to a religious life. 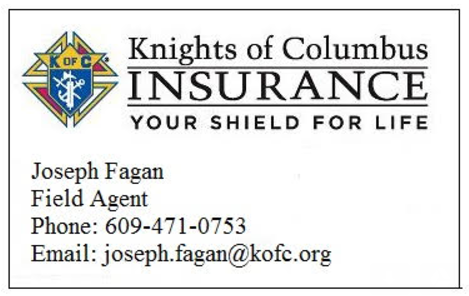 On March 14, Bishop of the Diocese of Camden Dennis Sullivan, along with Father Phil Johnson of St. Thomas More Parish in Cherry Hill and 30 other men, received the honor of the exemplification of the Third Degree of the Knights of Columbus at St. Peter Parish in Merchantville. 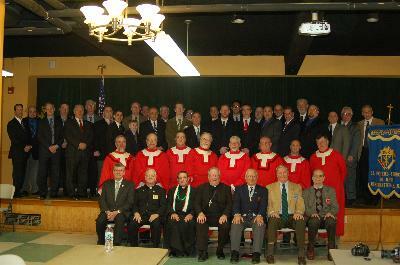 In attendance, as well, were brother Knights and dignitaries. Front row, Deacon Michael Carter; Msgr. Michael Mannion, Associate State Chaplain; Father Anthony Manuppella, pastor of St. Peter; Bishop Sullivan; Andrew Lipenta, State Deputy; Reggie Beckett, Vice Supreme Master, Fourth Degree; and Dr. Daniel Rossi, Supreme Director. From February 14-23, 2014, Assumption 3397 assisted in the collection and distributions for the Diocese of Camden FaithFULL Food Drive. The tally is in for Assumption Council 3397! Total food delivered for the FaithFULL–4,359 pounds.